Zino Platinum Scepter SeriesThere are 11 products. A medium to full bodied, extremely limited edition cigar. A shortened Robusto, the Pudge smokes with a full body yet medium strength. 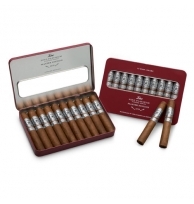 It’s a great cigar for anytime of day when looking for a full cigar experience in less time. In this Petite Corona shape, full and rich flavor is immediately present from the moment the flame graces the foot of the cigar. Each draw delivers big and powerful flavors. This Torpedo delivers lots of taste with medium strength. There is a pleasant complexity and long finish, touched with sweet and slightly woody flavors.